February 20, 2015 0 comments on "Three political predictions"
The Staggers‘ MAY 2015 dedicated election blog is rapidly shaping up to be important reading. Here’s a post of theirs that points out that there has been no big change in the polls in England and Wales. Instead, what has changed is Scotland, with the surge in SNP support since the autumn. In other words, Labour has lost at least a point because of Scotland, and maybe closer to 1.5 percentage points. That accounts for most of Labour’s dip in national polls since summer’s end. If you look at the Ipsos-MORI poll (the green triangle on the chart), about 11 per cent of the weighted total sample is Scottish. Therefore, the 39 percentage point uplift in the SNP share of vote they picked up in the November political monitor translates to 4.3 percentage points of national voting intention. There’s even a nice chart and all. Meanwhile, on the subject of Scottish politics, I argued that the only chance of EVEL actually happening would be if the Tories watered it down enough that Labour could accept it as a washup item. Not surprisingly, the upshot has been a no-deal, but was anyone expecting to find out that rejecting it was worth something close to a commitment from the SNP? Further on, the LSE election blog takes up something I blogged a while ago. 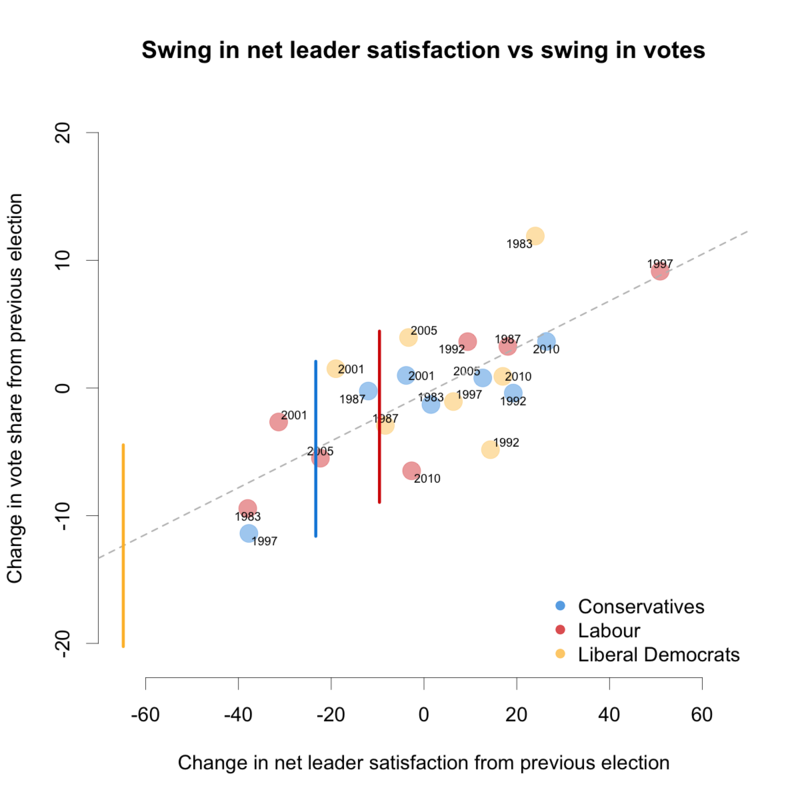 Is personal approval important in British general elections? The answer is that 10 points of approval count for about 2.3 points of national VI. Those would be the 1983 and 1997 general elections. So if you’re as popular as Tony Blair in 1997, or as hated as John Major was in that year, or riding as big a khaki wave as Thatcher in 1983, you might be able to win through personal popularity. Next Next post: Hamilton out. Wheeler in.